ACA and 107 Projects officially launch The New Plot – the 107 blog. The launch of The New Plot saw ACA Graduates perform in front of an all star panel and a VIP audience. 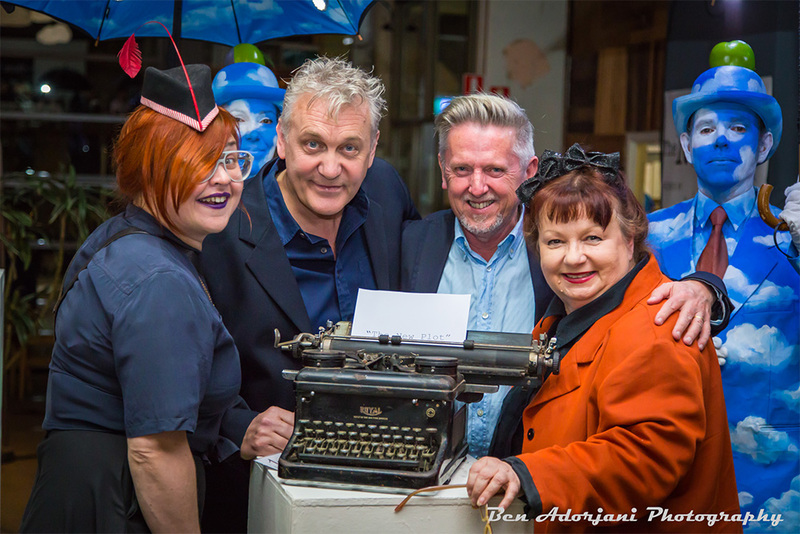 From the left: Jess Cook (Managing Director 107 Projects), Dean Carey (ACA CEO and Chairman of The New Plot), Stephen Sewell (playwright and Judging Panelist), and Gale Edwards (The New Plot Ambassador). As featured in The Australian on Tuesday 1st October. It all starts with a play. The playwright leads us all and we follow; we actors, directors, designers, administrators, producers – for without the playwright, we are nothing. It’s the words on the page that lead us to our unique communication, from our little wooden stage to the hearts and minds of strangers who, through the act of sharing the experience of the play, become our friends, our fellow journeymen on the path to understanding our humanity. The playwright is the seer, the interpreter, the provocateur, the commentator, the revolutionary, the entertainer (sometimes just to make us laugh, and that’s ok too). The surgeon whose scalpel can peel back the skin and examine the muscle, the sinew and the organs that lay underneath. Writing a play can be one of the loneliest experiences on the planet. It is an act of mysticism, yes. It’s also a very serious craft requiring skills, understanding of structure and character development, dialect, poetry and so on. And these things can be, and must be, taught. But the act of mysticism cannot be taught. Of course a play is not just a piece of literature. Plays are written to be seen, to be heard, to be spoken in a living space and in this instant. No play is complete until directors have tried to rewrite a third of it. Not that I am doing that at the Griffin, where I am currently working on a brand new Australian play with a playwright who sits there with his pen poised. And of course the actors who have walked around in the shoes of the characters and have constantly said, “My character wouldn’t say that.” “I don’t know why I am on here.” “What’s my motivation?” That’s always challenging to the playwright. But what began as a solo event, sitting at home staring at the blank page, spending nights awake and days distracted, now becomes an act of collective creativity. I had the pleasure of watching Tom Stoppard and Trevor Nunn at the National Theatre in London while they were working on the original, Arcadia. It was one of the most extraordinary moments of my life. Seeing the great Tom Stoppard – possibly one of the greatest living playwrights – sitting on a little stool on the side of the stage with his lead pencil in his hand, ready to change, rewrite or scrub out anything. “That didn’t work,” and Trevor, directing the play, saying over the top, “Well that’s not going to work.” And Tom saying, “Okay,” and rewriting it. This man is a genius, but there he was, learning from the actors and the director and from the working of the play in a living space. Finally, of course, the play must meet its destiny, for it was written for a group of people the writer has never met. I also sat next to Tom Stoppard in the Drama Theatre here twenty years ago when I directed the Australian premiere of Arcadia. And I sat there, as I always do on opening nights, feeling like I was going to die, holding onto the arms of the chair, staring ahead in a state of morbid terror. But when I looked to my right I saw that Tom Stoppard was in exactly the same state. I actually looked down and his knuckles on the edge of his chair were white, he was holding on so much. Now this is a man who has had more plays open in the world than most of us have had hot dinners, a man who had already had ten productions of Arcadia around the world in six different languages. But on that night, in that instant, in that living moment and with that audience in Sydney, Australia, he was completely focused on each laugh, each idea landing, each moment that was missed, how the rhythm was working. And he did not laugh or move his face once. Every nuance he had created was being subjected to a new judging panel: the opening night audience. As he stood up at the end to the roar of approval, there was really only one thing I could see him experiencing: Relief. And a sort of gratitude to the audience. A sort of gratitude that his ideas had been accepted, loved, laughed at, and cried with. A sort of gratitude in a man who is, pretty much, the playwriting god. If a play defines our universal humanity, it also reflects our national identity. Our Australian culture is reflected back to us. Give thought to the words of our Australian Bards and we are brought to the world through them. Look at the excitement created a few years ago when Cloud St went to the world. I think it went to four different countries. The effect was electrifying. So it is vital to encourage new Australian voices to follow in the footsteps of Sewell, Nowra, Williamson, Lawler and so on. We have produced some wonderful writers in this country. We need to produce more. Who we are the very essence of our society and our lives are passed to the world through the plays we write. And we must speak them trippingly on the tongue. I am going to end with a quote from Tom Stoppard about plays: “Words; they’re innocent, neutral, precise, standing for this, describing that, meaning the other, so if you look after them you can build bridges across incomprehension and chaos. They deserve respect. If you get the right ones in the right order, you can nudge the world a little or make a poem which children will speak for you when you are dead.” // Gale Edwards. Gale Edwards gave this keynote speech at the launch of The New Plot on September 26. To find out more about The New Plot national competition, go to thenewplot.org.